Ann Leckie burst onto the scene in 2013 with her debut novel Ancillary Justice. The first of a planned trilogy—referred to as the Imperial Radch trilogy—the book won nearly every Best Novel award in science fiction, including the science fiction triple crown: the Hugo, the Nebula and the Arthur C. Clarke awards, and redefined how we think about gender. While the novel itself, the heart of which was created as an intellectual challenge during a National Novel Writing Month, took years to complete, Leckie interspersed the work with short fiction, appearing in publications such as Realms of Fantasy, Strange Horizons, and Subterranean Press, as well as appearing in many “Best of” anthologies. The Radch novels have been called “hard” science fiction, but her body of work is much more expansive, weaving through genres with ease. Leckie plays with grand ideas and small truths. Her stories will surprise you with stealth mythology, religious imagery and, always, strong characters that stay with you long after the story is done. Often citing Andre Norton and C.J. Cherryh as influences, Leckie’s work continues to challenge and delight, and we cannot wait to see what comes next. Uncanny Magazine: “The Nalendar,” upon first reading, feels like a traditional, cautionary fable. Noble causes are rewarded; duplicity and avarice are punished, yet we are also given a nice gender twist with a protagonist who is taking charge of her own destiny. How much impact did traditional fairy tales and folk stories have on you as a writer? Did you have a favorite and/or particularly loathed tale? Ann Leckie: Like (I suspect) a lot of SF&F readers, I did go through a fairy-tale kick when I was a kid. I read nearly the entire spectrum of Lang’s collections, and a number of others, pretty much whatever I could find at the library. So I’m sure that’s part of my Writer DNA. At any rate, while fairy tales are certainly an essential part of my reading background, I wasn’t consciously trying to imitate or draw on fairy tales when I wrote “The Nalendar.” I was actually aiming the story at the then newly–revived Sword and Sorceress, so I was thinking of the kinds of things S&S had published in the past. I didn’t hit my target very successfully, I think, and unsurprisingly they didn’t take it, but that’s all right, I’d been hoping to sell something to Andromeda Spaceways for some time and was thrilled when they took it. 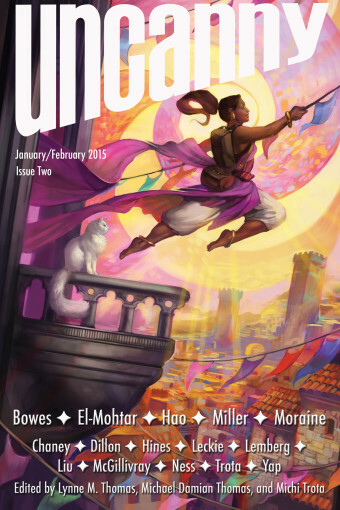 Uncanny Magazine: There are delightful bits of symbolism and subtle layers of meaning in “The Nalendar.” When approaching this type of story, how do you go about building the layers needed to support the narrative while weaving in other literary elements? What is your foundation? Ann Leckie: So, often I try to have some kind of real–life situation to build around, and/or a mythological underpinning. Not the sort of thing that you could go back and say “Oh, yes, that’s the sirens and that’s Circe and that’s the island of the lotus eaters.” More like a sort of foundation underneath that might provide me with a basis for images or narrative choices that have some kind of unity or logic to them. In this case, I don’t recall working with any sort of mythological structure. I did, however, spend a fair amount of time reading about oxbow lakes, and riverboats, and the various cultures and technologies of river transport. For a brief time, I toyed with the idea of using an underground boat wreck—these actually happen, when a boat sinks and the river changes course, and where the boat becomes dry(ish) land. That “ish” because often that land is pretty soggy and getting to those wrecks can be really difficult and complicated. Which is why I ended up going with the oxbow lake—but the sunken boat underground is still a really cool image, I think. Uncanny Magazine: “The Nalendar” is not your first story dealing with the concepts of gods and religion. 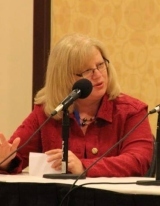 In a recent interview you talked about the resonance of religion, what makes it “real” to its practitioners, and how that should be respected. What is it about these subjects that keep drawing you back? As an atheist, do you think divorcing belief from religious narrative gives clarity to these types of stories? Ann Leckie: I’m not sure that an atheist’s perspective on religion is any clearer than anyone else’s—the more I’ve thought about it, the more I’ve become convinced that there is no perfectly objective “neutral” viewpoint. Everyone sees from where they’re standing. So, my point of view on religion is mine, and I hope offers something interesting to readers or to people I talk to about it, but I don’t expect it to necessarily be better or more objective somehow. I’m not a hundred percent sure what I find so interesting about the topic. Part of it is the incredibly elaborate symbolic frameworks that emerge around religious beliefs—sometimes, at the very beginning of a religion or a religious movement, you find people deliberately making things up, or deliberately constructing a sort of nucleus, but after that ideas and symbols just kind of accrete, and take on a life of their own, and mutate and develop and split off and it’s just kind of amazing. I’m also really fascinated by the way those images and symbols really mean something profound to the adherents of various faiths and practices. In the right context, all kinds of tiny things—words, pictures, tunes—speak volumes, and have a profound impact. Outside those contexts, they’re nothing. Tinny and flat, or even invisible. This isn’t just true of religions, of course, but that’s where it’s most obvious to me. Uncanny Magazine: A recent Barnes & Noble interview called Ancillary Justice, which won nearly every award there was to win in 2013 “…arguably the most lauded debut since [William Gibson’s ] Neuromancer.” This October, Ancillary Sword, the second book in the Imperial Radch trilogy was released. While every book release comes with its own excitement and anxiety, did you feel any additional pressure due the successes of 2013? Ann Leckie: Haha, no, there was no pressure at all! </sarcasm> Actually, it was freaking terrifying, in a way the release of Ancillary Justice wasn’t. There’s so much expectation, because of the reception of Ancillary Justice, that there’s just no way Ancillary Sword could possibly live up to it. No matter how fabulous a book it might be. And of course, as always, some people will like it and some people won’t, but unlike Ancillary Justice, there’s always going to be a “but how does this stack up to the last one?” evaluation. At the same time, seriously, I’ve got some nerve complaining, huh? Last year was incredible, and this year can’t possibly live up to it, and really that’s all right. Uncanny Magazine: Ancillary Justice has been lauded for its gender neutrality and subversive use of pronouns. In “The Nalendar,” Umri also subverts traditional gender roles and slays more than one dragon. We all talk about diversity in fiction—why is it important to you to critically examine gender in your work? Over time, and partly because I was working on Ancillary Justice, I gave the issue a lot more thought. Like a lot of issues that seem very simple at first, it’s full of complications and pitfalls, and so endlessly fascinating. But at the time I wrote “The Nalendar,” I just wanted to have a woman protagonist who seemed like a real person, not an assemblage of stereotypes or stylized gestures. As to why it’s important to me personally—there are all sorts of fascinating, complicated things that don’t engage my interest, but do engage others—I’m not a hundred percent sure. Like religion, I suppose, it’s just one of those things that hooked me. Uncanny Magazine: Thank you so much for taking the time to share these insights, and your wonderful story, with Uncanny Magazine.